So, this week I had my first experience with FreshDirect. I figured out early what I was making, so I ordered the appropriate produce, and I must say, I am very impressed with the quality of vegetables they gave me. It definitely seems cheaper to shop there for some things if you know what you need in advance. The downside that I learned the hard way is that they don't always pack things securely - for example, yogurt that can explode all over the box and all the products in the box (ew). They were pretty understanding though and gave me a refund for the ruined items. But it beats going to the supermarket where the produce quality is sometimes okay, and sometimes awful (and the farmer's market can get expensive sometimes...). 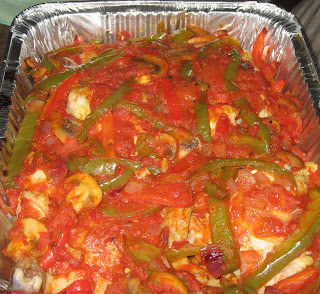 I came up with this recipe for chicken cacciatore last year. It was one of my first "original" recipes - I basically spent a bit of time researching dozens of different chicken cacciatore recipes and tried to assemble in my mind what I thought was common between all of them. In the end, I was able to put together a nice array of flavors that were what I think this classic Italian dish should taste like (mind you, without ever having tasted it myself before!). I think generally people like to put olives in chicken cacciatore, but I personally am not a big fan of the taste of olives, so I left them out. You can add them if you see fit - green is probably better than black. The addition of the couscous came out of not having an extra side dish to serve with this, so I took a page out of my mother's cookbook and built-in the side dish to the chicken (my mom makes potatoes underneath chicken). It came out well - just be careful if you reheat this dish on a hot plate or something not to burn the couscous on bottom. I used a red onion this time instead of regular for more color. 1. Season chicken. Brown chicken skin-side down in olive oil over medium-high heat. Transfer to a plate. 2. In same pan/oil, cook onions, garlic, mushrooms over medium heat until the onions are soft and the mushrooms have a nice brown color. 3. Deglaze the pan with white wine. Add crushed tomatoes and diced tomato, peppers and the bay leaf. Season the sauce too. Simmer together, covered, until sauce comes together and peppers are more or less cooked, but not too soft (about 5-10 minutes). 4. If using Israeli couscous, toast it in a skillet until they start to brown, making sure to mix constantly to ensure even heat distribution. 5. In a baking dish (sprayed with Pam), optionally dump couscous on the bottom. You can either layer some sauce above that, then place chicken, then more sauce, or just do the chicken then all the sauce - it will seep down and cook and flavor the couscous. Bake, covered, in a preheated oven at 350, for 30-40 minutes or until done (for this it's best to use a meat thermometer if possible; cooking time could vary depending on how cooked the chicken was when you browned it).